Brand new van. Ideally located! Purchased Sept 2018, we are proud to offer our comfortable and modern 6 berth caravan, benefiting from a great location on Kiln Park. Easy walking distance to the supermarket, pools, entertainment complex and all other facilities, yet in a tranquil road setting. There is ample space to each side of, and in front of the Caravan to provide an airy outdoor feel. Spacious, quality decking makes the most of the evening sun; accommodating 6 people comfortably. Quality rattan 6 person table and chairs makes for a great family outdoor dining environment. Parking is just 30 yards away. Bedrooms (1 double, 2 twins), are comfy and cozy, with a large living room and well designed kitchen with fridge with freezer bay above, efficient gas oven, grill and 4 hobs. Microwave oven. Dining table and seating. 40" TV with built in DVD player. 2 bathrooms, the main one with a shower. Relaxing walking distance from our Caravan's location to Tenby Town Centre via the beach or pathway. You'll arrive to find some games, DVD's etc to keep you all occupied with family fun. We ask for an initial deposit of £50 to secure your booking along with a £50 fully refundable bond. Full payment will the be required 4 weeks prior to arrival. Fun passes are to be purchased from reception upon arrival, giving access to the amazing entertainment complex. Sorry strictly no pets and no smoking in the caravan. Duvets and pillows are supplied, you will need to provide your own bed linen and toweling. A full inventory and a "we recommend you bring" list can be supplied upon request. Beautiful clean caravan with a 10 minute walk to the beach. Everything you need within walking distance. Would definitely recommend!! Thanks Lewis, you and your lovely family are welcome back any time. So happy you enjoyed! 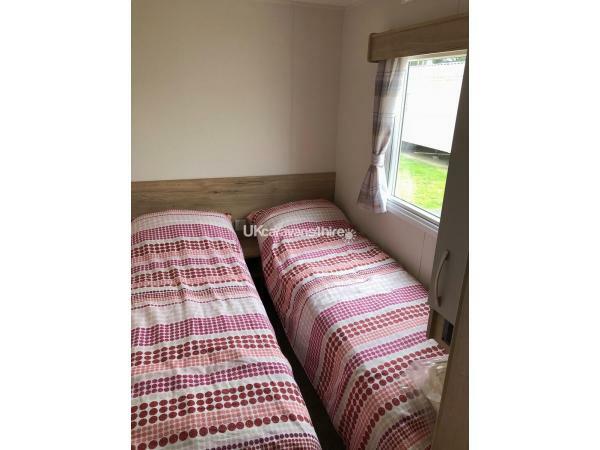 I decided to take my wife and son away for the weekend before the Christmas season starts in earnest and found this caravan online, the price was reasonable and so I booked it relatively last minute. The booking process was easy and accessing the caravan was straightforward. It was very well located in the caravan park - close to the beach and access points from where you could walk into the town. The facilities on site were closed for winter but that didn’t bother us too much. We went for a walk in the beach, my son and I kicked a rugby ball round and all in all had a lovely relaxing family weekend. Facilities inside the caravan were second to none and I loved the fact that there were so many board games we could use. A lovely weekend and will definitely look to repeat this holiday in the spring! Thank you so much for your review, so glad that you enjoyed the beach and found the caravan so comfortable and warm given the time of year. I hope that you'll book again! My husband and I decided at the last minute to have a little break and this caravan offered the ideal solution. It is well placed within Kiln Park and was conveniently close to the main route into Tenby and within easy walking distance of the onsite supermarket and leisure facilities. This is a brand new caravan and everything was in perfect order. There was a lovely big TV in the main living area, the bathroom was lovely and big - as was the shower which was a surprise and welcome bonus! The beds were also really comfortable. There is a fully stocked kitchen with all the dishes and utensils you could possibly need, but as my husband and I were only there for two nights, we opted to eat out. Dealing with the owners was a very straightforward and pleasant experience - they were very helpful and nothing was too much trouble. On the whole, despite the poor weather that weekend, we had a wonderful time and wouldn't hesitate to book this caravan again. Many thanks for your feedback it really is appreciated. I want my guests to have a great time and enjoy the caravan, the outdoor living and the great location. Given the weather you had the outdoor living regrettably had to wait for your next visit, but it sounds like you made the most of all the other benefits. See you again soon I hope!